Renowned wine villages are at the forefront of an effortless journey whilst traversing beautiful scenery. The Limassol region is a stronghold of traditional wine making with an excellent choice of local wines. 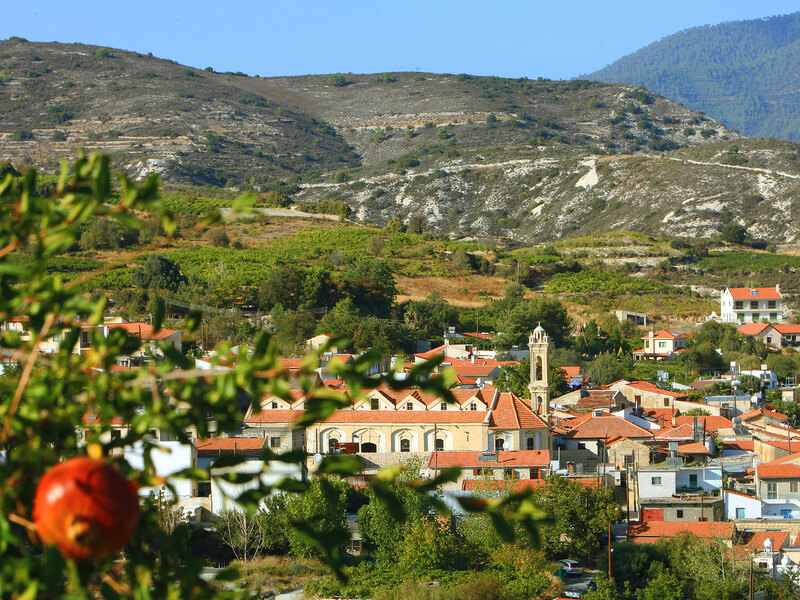 Nowhere else in Cyprus is there such a great presence of wineries as in these wine-growing villages of Lemesos (Limassol) district, known locally as Krasochoria (the Wine Villages). A dry climate combined with a unique geology is responsible for some excellent wines, made mostly from the local grape varieties Xynisteri and Mavro and also from some imported ones, such as Cabernet Sauvignon, Mataro, Grenache and Syrah. In Omodos and Koilani alone there are ten such wineries. 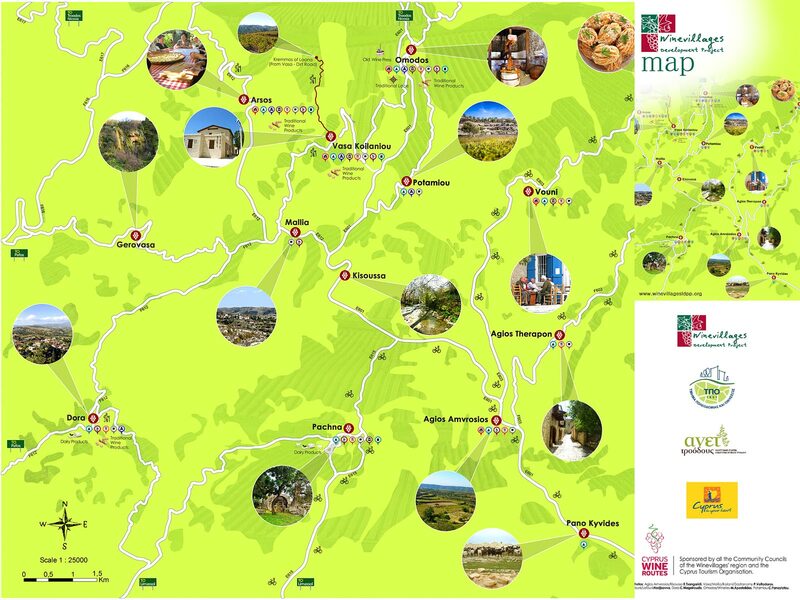 Make sure you have enough time at your disposal to travel this route and, of course, taste its special wines on offer. 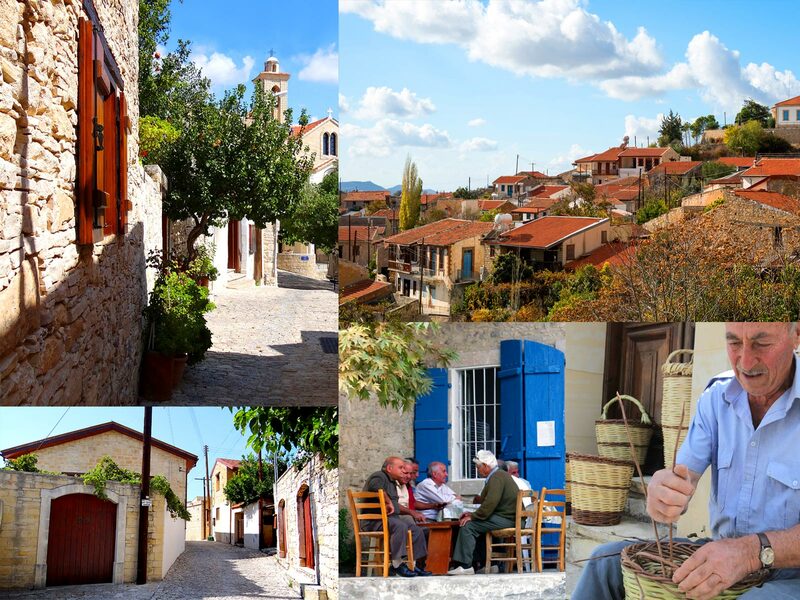 Visit picturesque traditional villages such as Omodos, Vasa, Koilani, Lofou and Vouni with their traditional architecture, cobblestoned narrow passages, joyful surroundings, many of which host some of the best taverns in Cyprus. 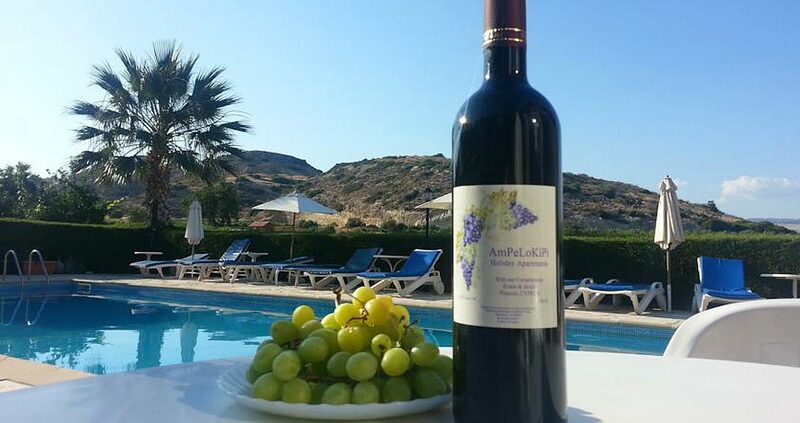 September is the traditional month of the grape harvest from the vineyards covering the rolling slopes of Cyprus. The vineyards are a hive of activity from March when the vines are pruned. Under the hot sun the vines have by now grown rapidly to the point where the grapes are now ready for harvesting. Families get together to harvest the year’s grapes before taking them to the local wineries to have them turned into Cypriot wine. During grape harvest season the growers are busy checking up on their crop and preparing for lots of hard work. In Cyprus, harvest season runs from August to mid-November. Grapes are traditionally harvested by hand, which is the preferred method for high-quality wine production. Manual harvesting may be tiring but the mechanical harvesters cannot harvest the steep slopes. In the weeks leading up to harvest, winemakers inspect the grapes with pH and Brix tests in the lab, and make frequent visitations to the crops to taste and examine the grapes. The higher the sugar content in the grapes, the higher the potential level of alcohol. Growers closely follow weather patterns to stay ahead of any sudden changes and fluctuations in weather fronts. Crops can be ruined by heat waves and excessive rain, so they are sometimes harvested early to avoid the risk of losing an entire year’s worth of toil and sweat. Despite being an arduous task, human hands remain the best way to sort the good grapes from the bad. Harvests can take anywhere from a five or six days to over a month. But in the end, all that hard work and dedication pays off as most of our wineries host a grand harvest meal and party for the partakers with lots of wine (of course! ), music, and traditional Cypriot dishes. Why not come and enjoy the experience for yourself? Although not many people around the world know this, Cyprus is historically one of the birthplaces of wine as we know it. 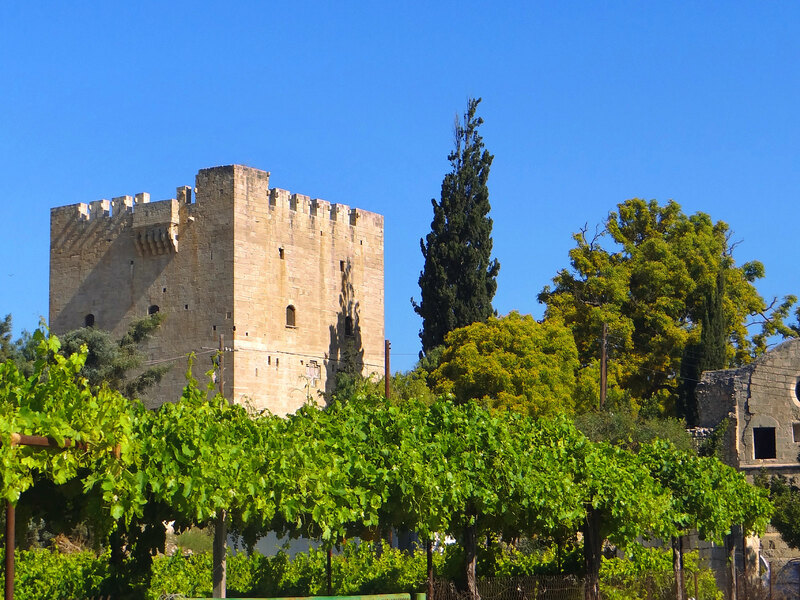 If you want to experience traditional viticulture, Limassol Villages are among the best places to see it. Weather: During these months Cyprus has hot and mild days, with cool notably cooler evenings than in July and August. Average temperatures range from 18 °C to 33 °C (64 °F to 91 °F). What to pack: Light-weight clothing is recommended for the day and medium-weight clothing (light jacket) for the evenings, especially in October. What to do: Swimming and water sports are still available during these months and due to milder temperatures treks in the woods and forests are ideal. What to do: This autumn month is ideal for picnics and outdoor sports during the day. Up in the mountains, the cold night temperatures mean that fireplaces have commenced use and provide cozy evenings conducive for reading and tranquility. 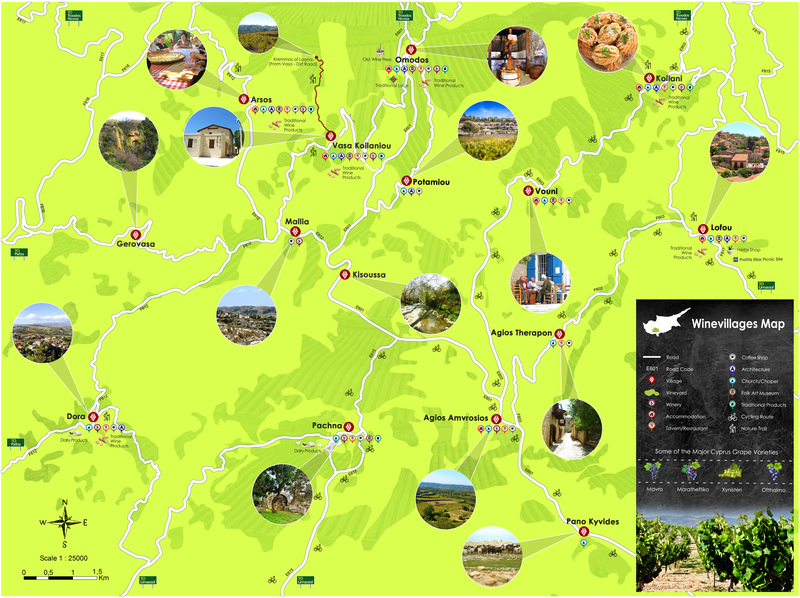 For wine lovers there are the Wine Roads in Cyprus where you will see all the vines and visit the best wineries. 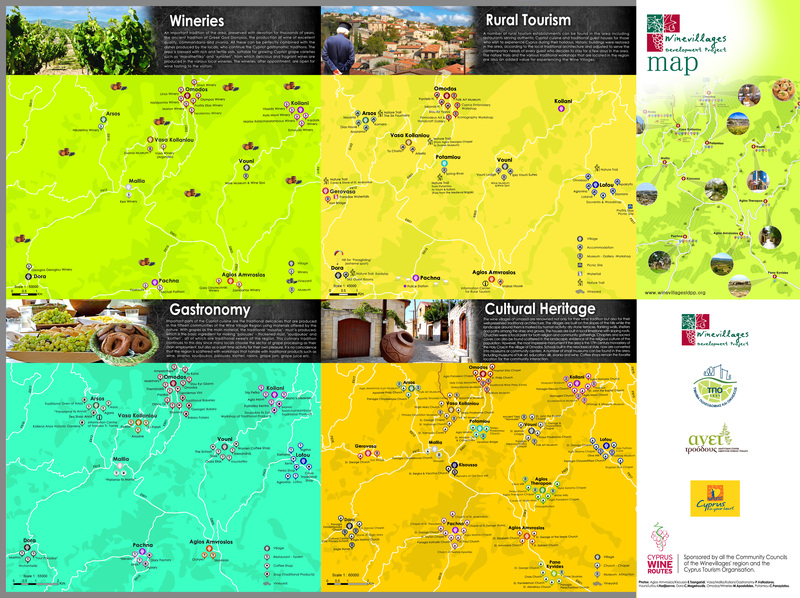 On this map you will find the scenic wine villages, and all the information you need to know about this wine region. Countryside: A short drive out into the surrounding countryside will take you through vineyards and quaint wine producing villages. Looking for Hotels in Limassol Countryside ? 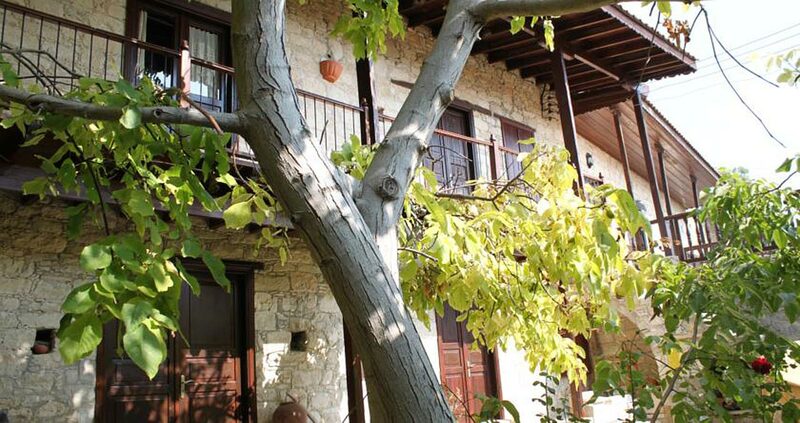 Explore our wide range of traditional houses in Limassol region and find the perfect hotel for your stay. Book your Limassol hotel now ! Featuring an outdoor pool and a snack bar, the family-run Ampelokipi Holiday is quietly located in a vine-covered valley. It offers self-catered accommodation and billiards. Pissouri Bay Beach with taverns and shops is 400 m away. All apartments are bright and spacious and open to a balcony with pool and mountain views. 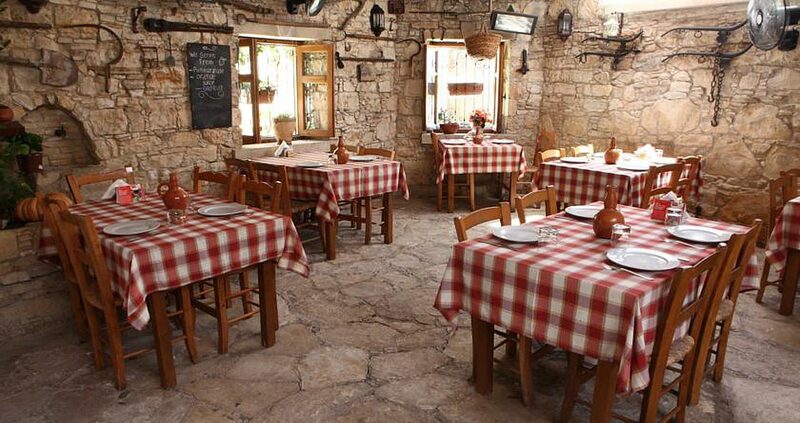 Quietly located in Lofou village of Limassol, Agrovino Lofou is a traditional, stone-built property dating from 1794. It offers self-catering units opening out to a patio or balcony, and free Wi-Fi in all areas. A shared terrace is also available for guests. 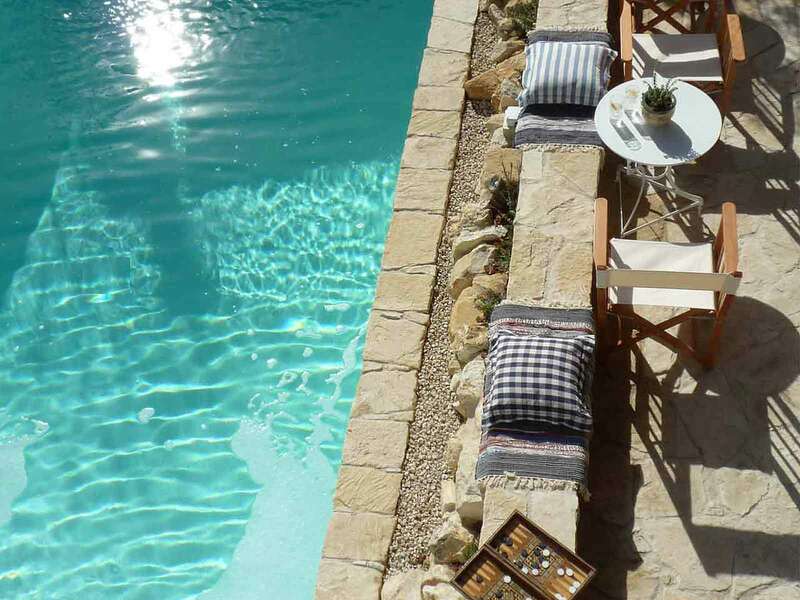 Stou Kir Yianni is a traditional guesthouse with self-catered accommodation with mountain and village views, a restaurant and a bar. It is set in a listed building in the centre of Omodos village, on the southwestern slopes of Troodos mountain range. 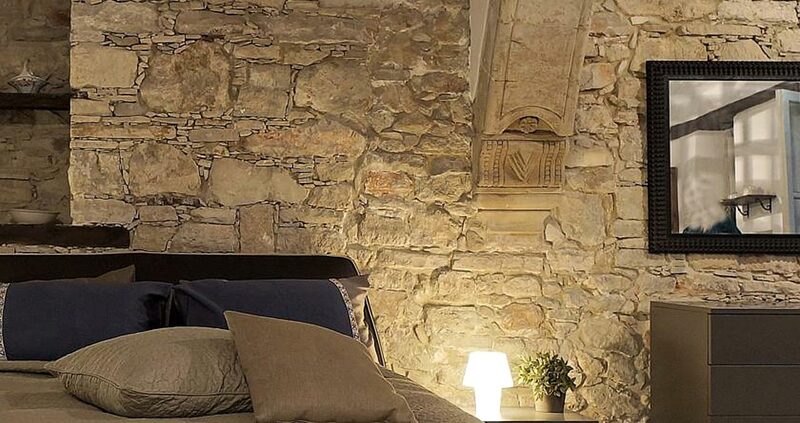 Guests may choose to stay in studios, stone-built cottages with private entrance or private villas. 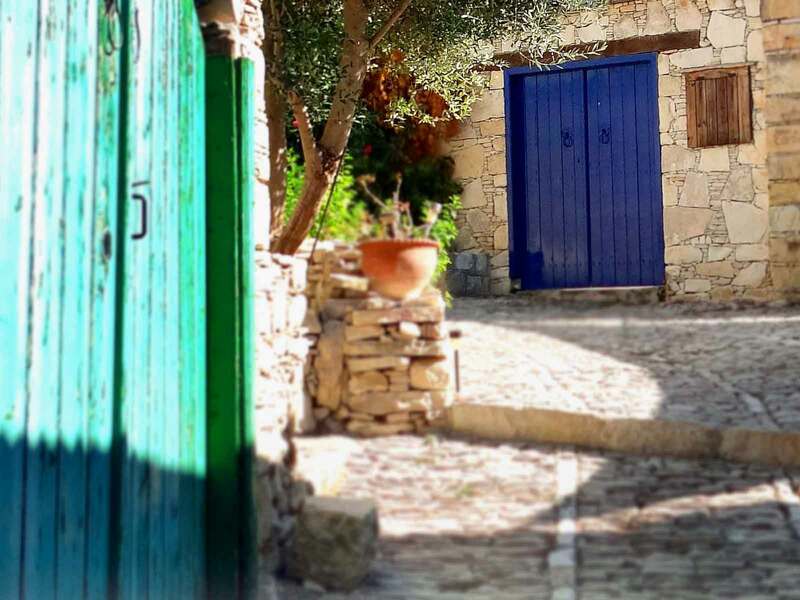 Quietly located in Arsos village, Moustos Traditional House is a stone-built property surrounded by lush greenery. 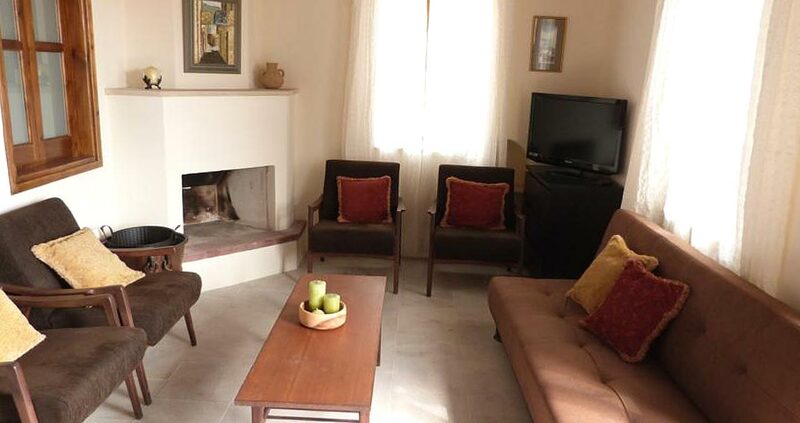 It offers split-level, self-catering accommodation opening to a balcony and patio with Troodos Mountain views. Free Wi-Fi is available in all areas.